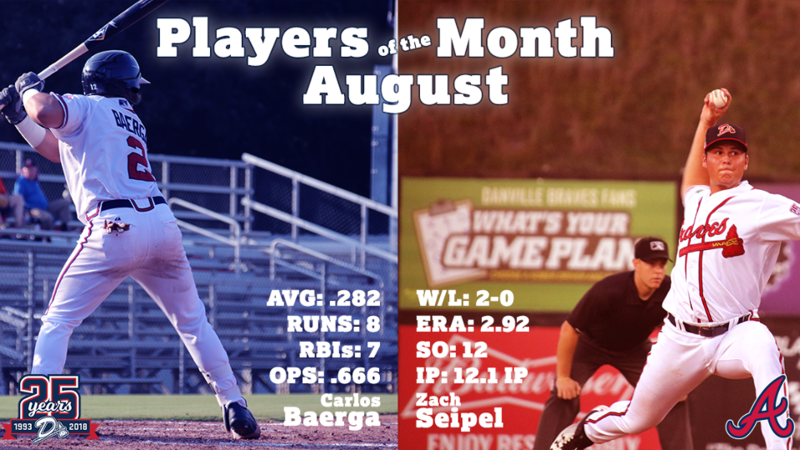 Baerga Jr., 23, was named the D-Braves Player of the Month. The outfielder managed five multi-hit games and a .282 average with seven RBIs and eight runs scored in the month of August. The left-handed hitter earned a .666 OPS, adding a .342 on-base percentage. The son of MLB veteran Carlos Baerga, finished his first season in Danville with a .235 average, a home run and 13 RBIs and eight doubles through 45 games. Seipel, 21, was touted as Danville's Pitcher of the Month. In seven appearances out of the D-Braves bullpen, the right hander owned a 2-0 record with a 2.92 ERA in 12.1 innings of work. The product of Eagen, Minnesota, sent down 12 opposing hitters with an opponent's batting average of .222. The 27th-round pick of the 2018 draft produced a 3-0 record with a 2.63 ERA in 24 innings of work, 30 strikeouts and three saves in his first year of professional baseball. Two former D-Braves from the 2018 squad, AJ Graffanino and CJ Alexander, earned organizational honors as well. For offseason updates and information about the upcoming 2018 season, keep close tabs to dbraves.com.